So ran a few tests and I can't seem to get my set up so my figure looks like she's on the ground. Any advice of which component to translate to make that happen? Also, WTH.... there are two file and both are so small I kept thinking "this can't be it" but it is and all bits seems functional. You should move IBL Master Control to get the ground plain shadow where you want it. This is because Iray doesn't really have a functional way to move the ground plain independently of the environment dome. Though I might be able to offer more help if you show me a picture of the viewport, the Render Settings tab, and a render. Yes, the two install packages you need for this product are tiny downloads. Why would you turn them all on. Eeek! You don't have to go hunting for the ReadMe though. I've put specific step by step instructions on plane props in the same directory that you load IBL Master from. One of them is specifically devoted to Boost Lights. Just double click to load the instructions and read them in the viewport. Hate to sound like a complete noob, but I got this set b/c you sold me on fast and 3DL and use stuff I already had LOL. I can't find the instructions that are mentioned. This is why I hate the IM b/c I can't find stuff like I used to in true zip files. Anywho. How do I find the instructions, please. If you can give me the file name I can probably just search for it. Thanks. Can't wait to try this! ...so been referred here, For 3DL does this require use of an HDR envvironment (most of which are UE based) or will it work with full geometry sets, skydomes, as well as AoAs Distant and Spotlights? So IBL Master solves a bug with UE2... but we have to add UE2 bounce light still, right? Got you. Finding the intructions is a problem for a lot of folks. That's why I've put the instructions on 3 plane props that you can load into the viewport to read. You can find them in the same place that you load IBL Master from ( in My Library > Props > Parris > IBL Master). I got the idea from ThePhilosopher. Depends. Did you see my answer to your questions on page 4 of this thread? 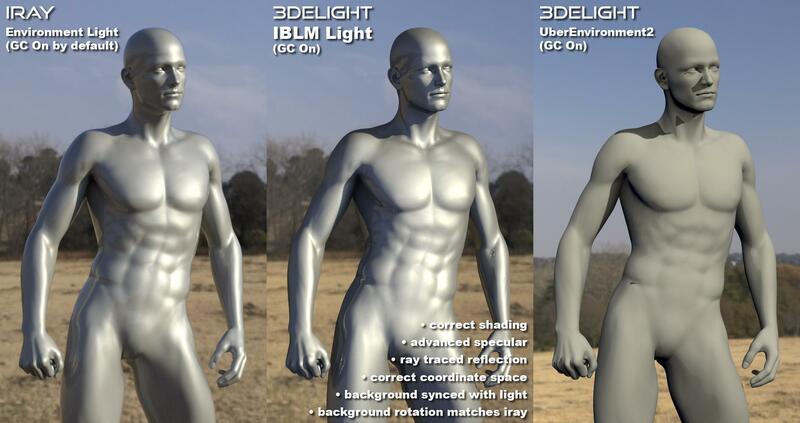 I have been trying out some 3delight renders but do not appear to have all the IBLMLight settings as your enclosed instructions suggest. Any ideas? I am using an iMac, and did a manual install with no problem. There were 3 files as shown in the copy from my account download page. The first folder contained identical files to the second download of (1 of 2) ? Not sure why it was there. The remaining folder (2 of 2) contained some scripts and shaders Daz Studio 4.5;4 private build and public build. ? Not sure where these had to go. I placed them in my script and shaders folders, but they don't appear to belong there. The Iray functions are all working perfectly. Thank you for the details and screeshots. Very helpful. Yes, Daz Studio is clearly not finding the 3DL IBL shader files which are in the package labeled (2 of 2). Daz needs to remove that extra package, I think. Doesn't Daz provide you with a way to have the files installed to the proper directories for your iMac installation of Daz Studio, like the Mac version of Install Manager? Please let me know if this helps. I will alert Daz if this seems to be a Mac issue. There is a Mac installer, but I always do a manual install of files so I know where everything goes and can subsequently be found. This is a brilliant product, and I left a comment to that effect earlier in the appreciation thread that is currently running in the Commons forum. My kindest regards, and wishing you and your family a very happy new year. Wow, thank you! Appreciation thread sounds cool. I'll see if I can find it. Wow, really cool. I didn't know you could do that. Awesome! Yes, I address that problem specifically. Please see the first posts and store page for details as I'm running out of breath. Thanks for getting back so quickly, and sorry I missed that . . . sold! ETA: I am so looking forward to being able to render animals with my own custom designed hairs in HDRI environments in 3DL! Holy [email protected]#$%^&, yes. I would love to see what you end up doing. Thank you! My directories are a bit off from everyone else's in part I think to how I had stuff set up in Daz 3. I found them though. Yay! Yeah the catalyzer for LAMH did wonders for addressing the fact that Iray doesn't handle curves, but only works on AM's presets. I know I'm not the only person who will be all over this for that reeason alone. Bought and DLed. Now I need to find some time to sneak away and play without landing myself in the doghouse lol. Oh, and I just realized that I'll be able to render out a proper depth pass from my custom shaders/scripts that supports transparency for use in post (and the displacements will actually match since they're both be rendered in 3DL). Oh happy days! I know I've already said it, but I'm very much looking forward to your future work in 3DL going forward. In the mean time I loaded up the file. Here is a screen grab. You can see on the left side there is transforms of the selected scene bit of the IBL Master. The HDR is a cliff beach scene. There's actually plenty of flat land for Tina to be on but as you can see she's floating quite a bit. I went ahead and kept moving the dome until it looked like her feet would touch ground and they did according to the render but the entire back or foreground is blurry and curved so that's no good either. Just want to understand what I should do in getting a more crisp, realistic look out of this. Hi, I'm using Studio 4.9.4.122 with Window 7 64 bit. I have IBL Master installed, including the second folder script and shader folders in my Studio4 main directory. They are correctly installed. I followed the simple included plane instructions, but I am very confused with the result. I load the IBL Master prop, then load an Iray preset HDR. Rotating the control sphere has no effect at all on the actual rotational position of the hdr. I thought that was a major point of the product, so I could see what was happening with the hdr by looking at the control sphere. I can see the hdr image on the control sphere, but the image rotation in the control sphere does not correlate with the hdr image rotation position that renders. Rotating the control sphere has no effect at all on the rotation position of the hdr. Nothing. Tried several hdr-only quick renders. What renders, in terms of rotation, is not what the control sphere is showing me. Even tried rotating the hdr manually in render settings but that has no effect at all on the image projected onto the control sphere. Again, no correlation between the Iray enviroment and the control sphere. In other words, there is no "accurate realtime 3d preview" at all happening, and that can't be right. According to the promo video, which I just watched, there is supposed to be. So what is happening? The install was very simple. Don't see that I might have messed that up. Is there a possible open cl/gl issue, like a particular version required? Some setting somewhere? I have no difficulty doing Iray renders, though cpu only. Having that, is there some other hardware/software requirement? I hope this can be sorted out. The real time preview was THE main selling point for me. Bummer indeed. This is also my problem when using IBL master what I see in the viewport is not what is rendering. Very sorry to hear you're having problems. First thing is you need to be running 4.10 or newer. Also sounds like the scripts that do remote control are not running. What a drag! And of course no internet access complicates things from a technical support perspective (though please bare in mind that technical support is officially Daz's part). There is a chance here that what you need help with is beyond the capabilities of a PA, so please don't forget you have a 30 days to return this. But I will help if I can. Can you upgrade to 4.10 at this time? We need to start from there. Well. So annoying. I have 4.10, didn't install it because the major upgrade seemed to be dForce, which my laptop can't support the open cl version dForce requires. Unless someone else has some input on this, like Parris maybe, and why the promo page says 4.10 recommended, not "required," I'll go for the refund. I'm using 4.10 and have internet access and used DIM to install is there any reason why I may be having problems. The images help, thank you. To keep things synced, you should be transforming IBL Master Control, and not the 3DLEnvSphere, but I understand you may have done that to try and remedy things. As far as I can tell though the HDRI you are using is very distorted (maybe not equirectangular?) and the shadows it is producing are weak because of the type of HDRI. In general, if you have a bright sun in a cloudless sky, and if the HDRI creator has given it the right dynamics, then you will get crisp shadows. Blurred, cloudy, or inadequate dynamic range will produce weak or blurry (soft) shadows. Iray, IBL Master, or other IBL shaders cannot fix this. You need a better HDRI for the purpose you want to achieve. If the shadows are too dark, on the other hand, you can control that in the light settings for the IBLMLight. I hope that helps. Would not one installer file be better? Wow! We are making you work for your money! You thought it was hard just making the product, lol! I'm in for one, looking forward to trying it! Good job on the video! I notified Daz and it looks like they already got rid of the redundant installer (IM00048959-01_IBLMasterforDazStudio.zip - 1,549 KB). I think the two installers might be necessary because the light shaders get installed elsewhere (not sure). You can find a lot of tips, short tutorials, and step by step instructions in this thread, the video, and the instruction plane props that are in the same directory as IBL Master. Just doubleclick to load. Some good information on the store page too. Be sure to look at the promos that are screenshots and demonstrations. If you have un answered questions, please let me know. I will do what I can. I really want IBL to be easy for everybody. If you are concerned about upgrading, then try the BETA 4.10 instead. You can have the beta installed right along side your regular version of Daz. In fact, I still have 4.8 installed because I still use it some. I only used 4.9 (and now 4.10) in the beta. This has not posed a problem for me other than a few plugins not working in the beta. But dforce, iray upgrades, and scripts all run like they should. And this way you can safely test to see if 4.10 will run on your laptop.